Dr. Ton-That was born in Viet Nam, but his family decided to escape from the communist regime for a better life in 1978 when he was 9. They settled in Wichita, KS where he grew up and graduated as valedictorian from Maize High School. He received his college education from Wichita State University and a medical degree from the University of Kansas School of Medicine. 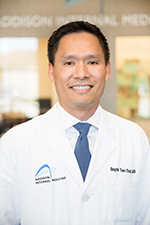 After finishing his internal medicine residency at Baylor University Medical Center, he started his medical practice as a hospitalist at Baylor Garland Medical Center in 1999, transitioning eventually to an outpatient practice at Dallas Medical Specialists in 2004. Hoping to continue providing care to the surrounding communities, Dr. Ton-That relocated his practice to Addison Internal Medicine in 2013.